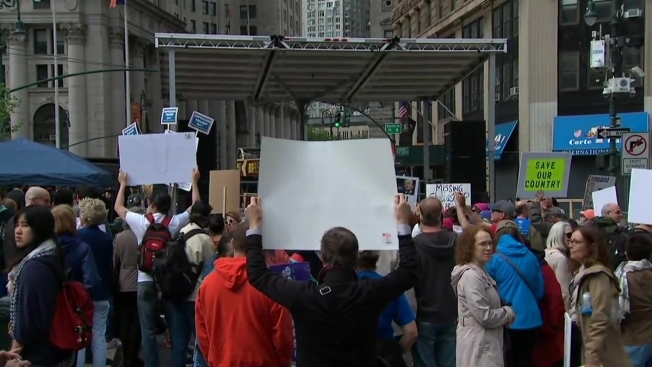 Hundreds of people marched Saturday through lower Manhattan to demand an impartial investigation into alleged Russian interference in the presidential election. The "March for Truth" was one of many demonstrations held nationwide. The organizers were also calling for an investigation into ties between Russia and President Donald Trump and his associates. People gathered in Foley Square and listened to speakers. Javier Munoz, who plays the lead in Broadway's "Hamilton," sang a patriotic song compilation. Then the group set off to march down Broadway. Some carried signs that read, "Alternative Facts Are Lies," "Facts Matter" and "Save Our Country." In New Jersey, a few hundred protesters rallied near one of Trump's golf clubs. Democratic U.S. Rep. Bill Pascrell applauded the protesters from the back of a red pickup truck in Bedminster Township where an effigy to Trump was covered by an American flag. Pascrell says that the protesters have made grassroots resistance against Trump a crusade and "those of us in the Congress who appreciate it can't get enough of you." Activists have been gathering in the area every weekend since last month. They're rallying at a park that's about four miles from the golf course.